Is there a way to disable the automatic replacement of the hyphen with the en-rule? In fact, this creates problems with the actual version of biblatex and LaTeX. Biblatex has already the function to change hyphen to en-rule. In the actual situation, the fact that Citavi does this job already forbids shorten the page range, as the en-rule is not recognised and the page range cannot be shortened. At the moment and this is what I need help, the only solution is to do a full replace of the en-rule into a hyphen after every record is entered. This solution is not entirely practical, and the search and replace function seems not working if you search all the records in Citavi 3.1.36. There is also another problem, at least for my point of view. I use the journal abbreviation function quite a few times, as the abbreviation is used in different book formats. It seemshowever that as you specify the full title of the journal, that becomes the only field exported in BiblaTeX. For instance, if I give to JEA the full title of Journal of Egyptian Archaeology, it will be the latter appearing in the relative .bib file and not the former, as I would like to use. What I would like instead is using the abbreviation I have specified, unless I decide that I want the full title. Again,the only solution I see at the moment is of having to do a full search and change the full titles of a journals in the abbreviation I want to use. Thanks very much for your question, and my apologies for the slow response! First, please update to Citavi 3.2 if you haven't already. Next, during the BibLaTeX export, please make sure that you select the checkbox Use LaTeX notation from the list of BibTeX export options. Then the em dash should be replaced with two en dashes. Regarding journal abbreviations, I will have to check with the developer who is responsible for export filters tomorrow. Thank you very much in advance for your patience! maybe its a little bit late but I got here because at first I had the same problem with the abbreviations. File > Export, click Next and then click Edit BibTeX export definitions. Click Next and choose Journal article from the For reference type drop-down menu. Now scroll to: Periodical:Abbreviation 1 and type in the (so far empty) field: <journal> (instead of <shortjournal> in Jennifer's description) and click the circle to activate. 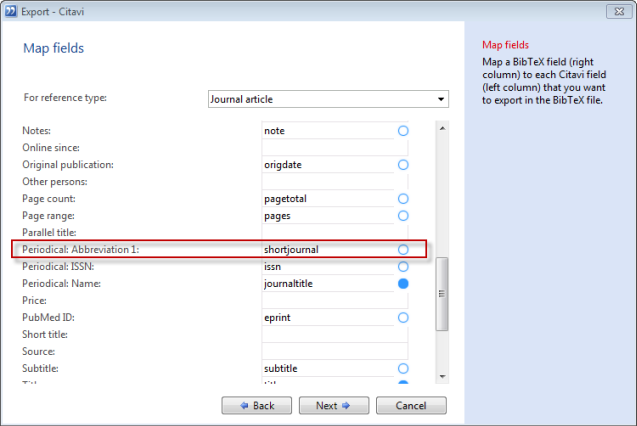 Then scroll down to: journal name and clear the field where <journal> is written. The circle will disappear and the full name won't be exported. One should ensure that every entry has an abbreviation, because it will not insert the full name if the abbreviation is missing.